Annyeong hasayo and welcome to another edition of Mastication Monologues! So this past weekend was quite action packed, and I thought it was going to be a restful day on Cinco de Mayo. Korea had other thoughts. Instead, I found myself outside in the middle of Seoul on a beautiful day at an international food festival. There were tents all over the streets surrounding the Seoul city hall where people from all over the globe were offering opportunities for visitors to learn something new about a different culture through music, clothes, and my favorite, food. It was extremely crowded for some interesting countries that I wouldn’t have expected like Kyrgyzstan with their shish kebabs or Iraq with their own version of doner kebab. I guess people can’t get enough of roasting meat over open flames on sticks. Perhaps it hits some sort of primal chord within us that hearkens all the way back to our prehistoric ancestors when they felled their first woolly mammoth and had history’s first barbecue. I wasn’t swayed by the Central Asian sensation and instead went for the funkiest things I could find from countries’ cuisines that I have never sampled before. First up, Kenya. 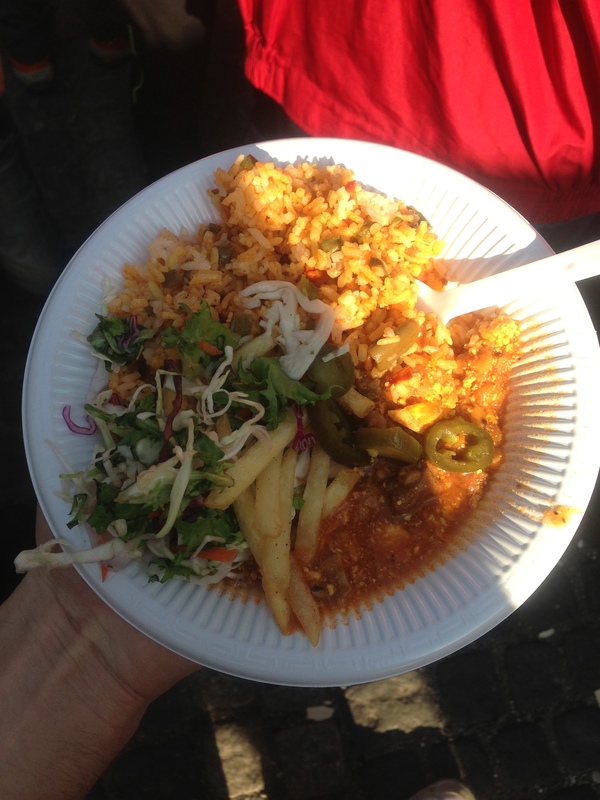 After breezing through Asia, Europe, and Latin America, we went to the African stalls. 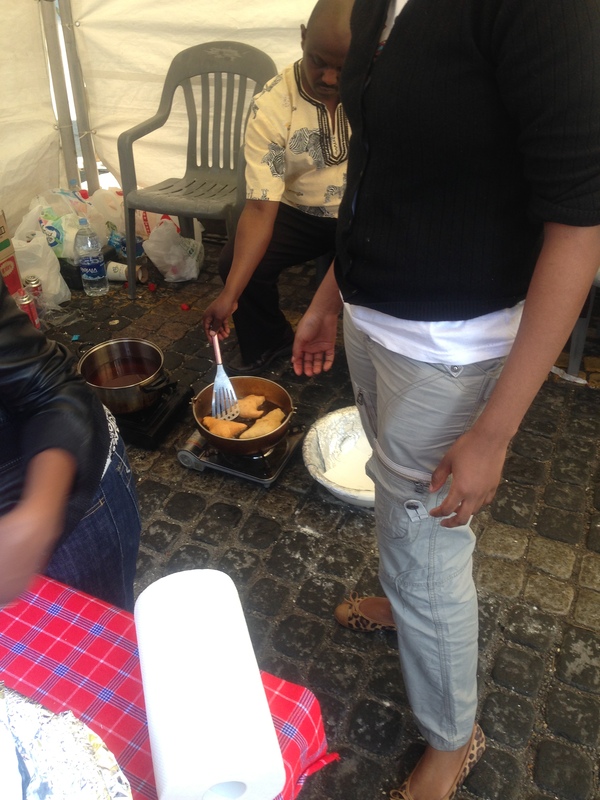 Once we got to the Kenya tent, there was a delicious aroma wafting through the air, and we quickly found the source. It was the smell of fried mandazi. 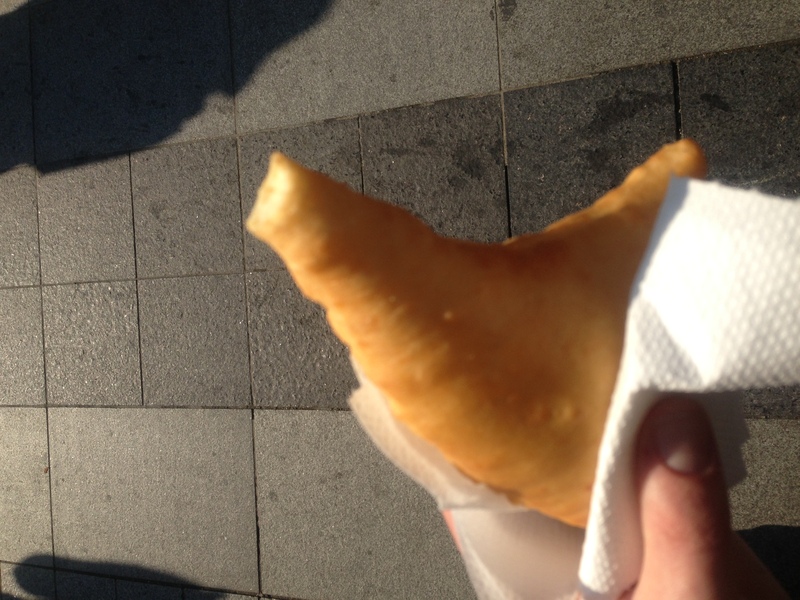 They looked like gigantic samosas which are fried dumplings that contain vegetables and meat, but I was greatly mistaken when I was handed a freshly fried one and took a bite. It was piping hot and perfectly fried to a golden-yellow similar to the sun that was shining that day, but it was a sweet, not savory, treat. It was kind of like a freshly fried American donut but not as sweet. My friend Ben said that it could use some powdered sugar, and I wholeheartedly agreed. Either that or maybe some sort of dipping sauce. Still, mandazi was a solid first choice out of many at the fair. Next up, Iran. 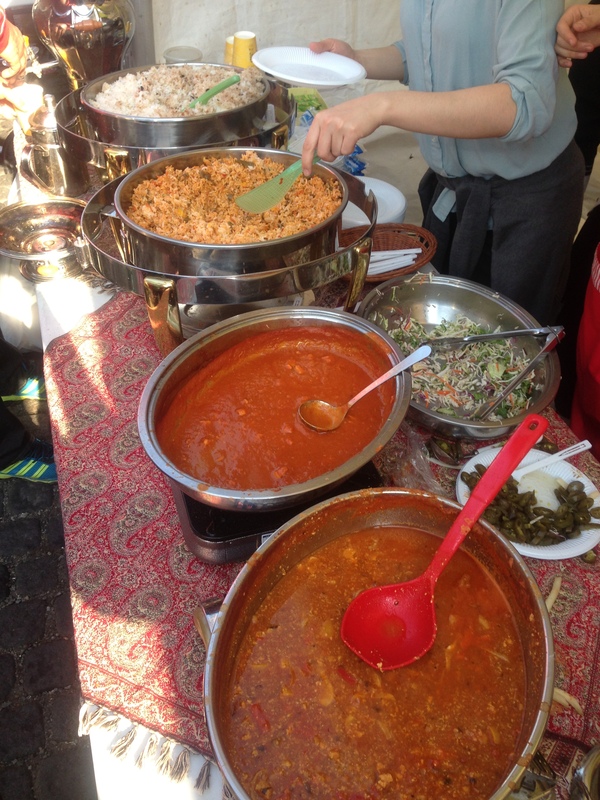 I have had Persian food before, but I never saw these two types of food they were serving: geimeh and zereshk polo. I decided to only pick geimeh because the zereshk polo was pricier. Geimeh has roots all the way back to Mesopotamia and is a stew containing lamb, tomatoes, peas, and onions while being garnished with potato fries and jalapeno peppers. I also got some seasoned rice and a mini salad on the side. Overall, it was a solid choice. The stew was quite hearty with large pieces of lamb that were very tender and the vegetables added extra body to the stew. It went very well with the rice that was seasoned with tomato paste, cumin, and tumeric and contained more peas and some carrots. The salad was fresh but was not very impressive. However, the potato fries were a unique element to the meal because they weren’t exactly like typical French fries because they were in some sort of spice that I couldn’t quite identify. The last two snacks came from Asiatic countries: Singapore and Malaysia. 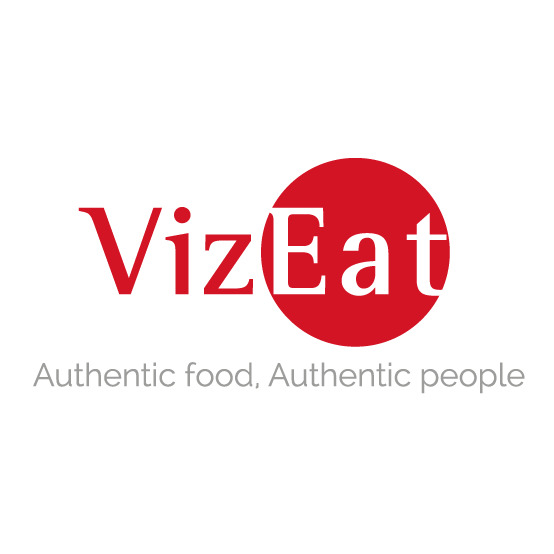 I already knew the Singaporian cuisine is a reflection of all of the different ethnic enclaves that occupy the tiny but rich southeast Asian nation. 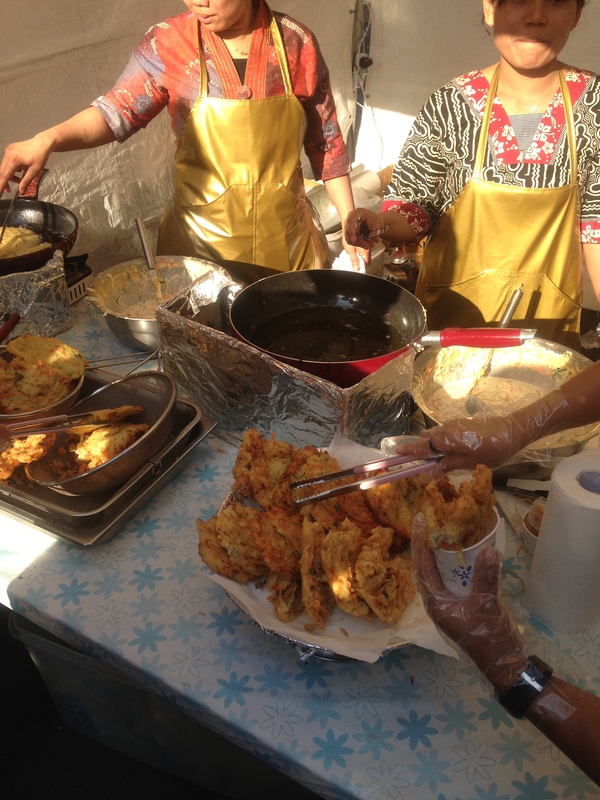 So when I saw small fried vegetable fritters, I could immediately see influences from both the Indian community with their love for fried treats like samosas while the cooks were using Chinese vegetables like bean sprouts, Chinese celery, carrots, bok choi, and spring onions. It was about as big as my hand, but it was kind of a let down. While it was expertly fried, the vegetables were drowned out by the greasy aftertaste of the dough. There in lies the fine line one treads when frying food. Harmony has to be struck between using enough batter while allowing the internal ingredients to shine. While the Singaporean food let me down, my final choice from Malaysia ended up being the most bizarre and my favorite food out of all of them. I saw no one was going to the Malaysia tent, so I walked up to see they were offering sago gula melaka a.k.a. “best seller” according to their sign that had the price slashed. It was somewhat worrisome, but I asked them what it was. They said it was, “Sweet dessert coconut”. Those three words together sounded great to me, so I got one cup of it. After about ten minutes of breaking into the Fort Knox of dessert cups, I opened the container to find something that looked absolutely disgusting. It looked like someone puked in the cup and then threw in some pale yellow fish eggs that had congealed into a small sponge. I was wondering to myself how could something so terrible looking actually be delicious? I was quickly proven wrong when I took a spoonful of the brownish-white goop. A perfect example of never judging a book by its cover. It literally tasted like a vanilla pastry sprinkled with coconut. Texture wise it was different too because it was semi-gummi but quickly disintegrated after a couple good chews. This is because sago is derived from a plant similar to the tapioca root which is used in Asian cuisine to make gelatin. The brownish white soup was palm sugar syrup which supplied the vanilla-esque sweetness. 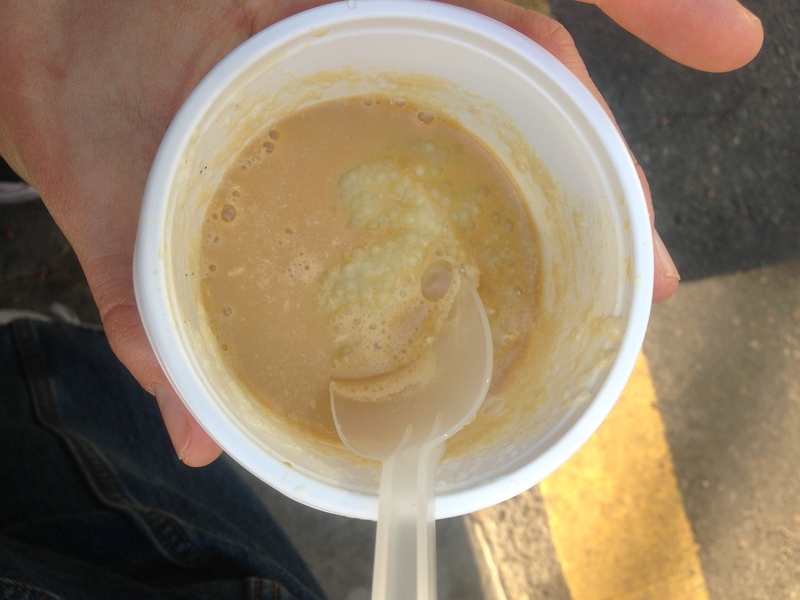 Sago gula melaka is the prototypical ugly duckling of desserts in my experiences, but I would recommend anyone who has a sweet tooth to try it. Overall I had a fun time at the food festival, and it just goes to show that if you try things that may seem scary, there really isn’t anything bad about them. So follow your stomach and go explore the culinary wilderness!